I stumbled on the NYC Fire Museum completely by chance when I was downtown last week. I almost walked past it, but noticed the flag waving outside and thought it would be worth a visit. 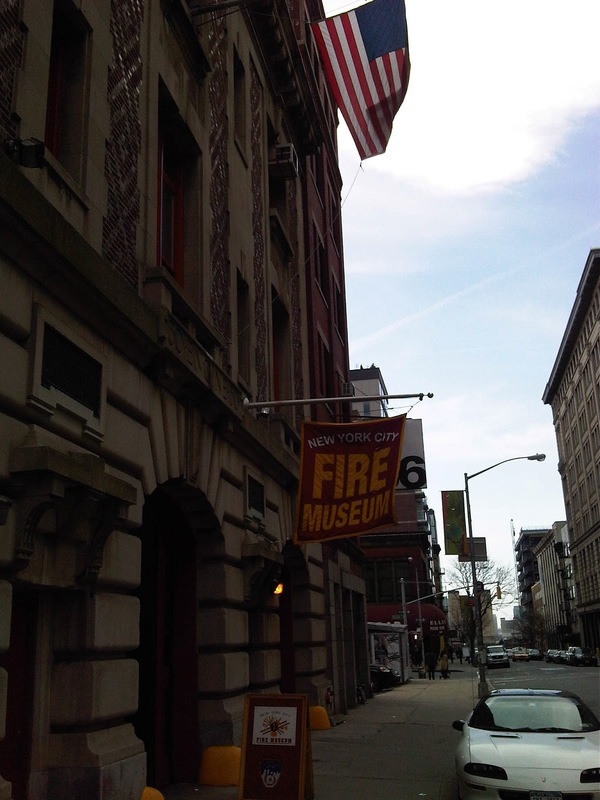 The museum is located in the old fire house of Engine 30 at 278 Spring Street, west of SoHo, and is the official museum of the New York Fire Department. I have never been in a fire house before and it was interesting to see the layout and how it may have worked when it was in use. The museum is situated on the first 2 floors of the building, with the top floor reserved for private functions. There was children's party there when I visited, so it was quite noisy! I started on the 1st floor of the museum which is home to historic memorabilia dating back to the 1650's. 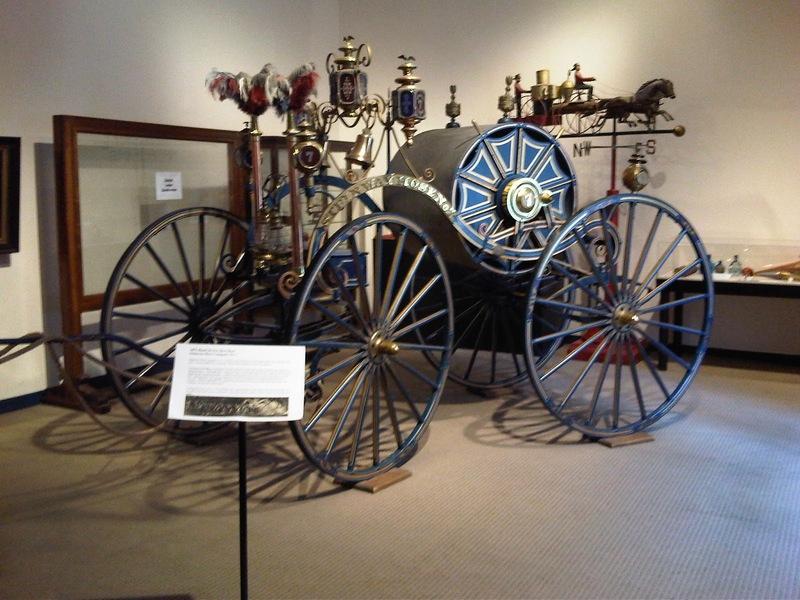 You can see horse drawn fire trucks, historical uniforms and equipment as well as the 'Firefighting on Parade' and 'Romance of Firefighting' exhibitions. The ground floor contains more modern fire apparatus, tools and equipment. 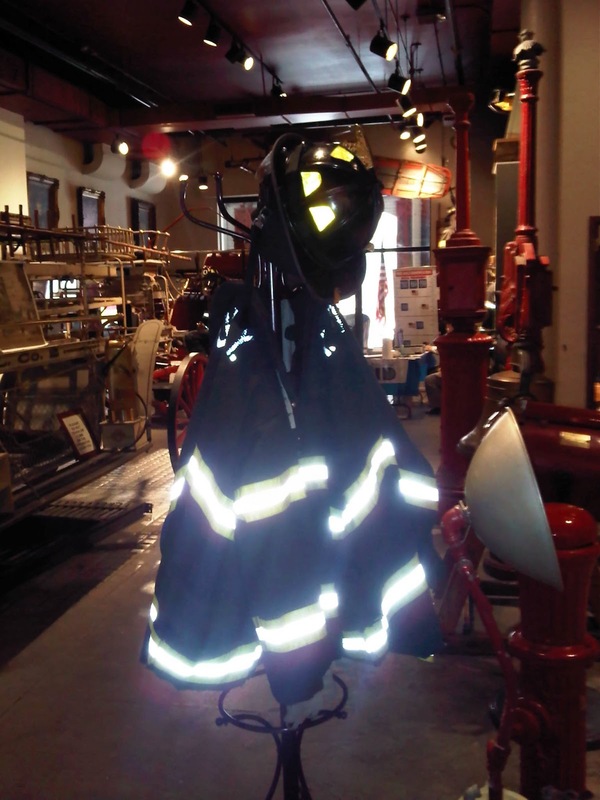 Here you can try on uniforms and get up close and personal with real fire fighters waiting to answer questions and tell stories. For me the most moving and memorable part of the museum was the '9/11 Memorial' exhibition. There is a memorial made of 343 tiles containing the names and photographs of each firefighter who lost their lives on that day. They have artifacts recovered from the World Trade Center and photographs taken on the day and the days that followed. A second room if full of art work and images paying tribute to the fallen firefighters. It was a moving and emotional exhibit. On a lighter note, there is a lovely little shop on site selling all sorts of NYC Fire fighter apparel, books, costumes and souvenirs. They also have an online store which sells a wider variety of items. I was pleasantly surprised by my visit to the New York City Fire Museum and it is worth a visit if you are in the area. It is only $8 for adults and $5 for children, and is open every day from 10am to 5pm. For more information visit http://www.nycfiremuseum.org. I have been back in NYC for over a week now and things have been so hectic I haven't had a chance to write until now. It was great going back to the UK and catching up with friends and family. My time went really quickly and unfortunately I didn't get a chance to see to everyone I wanted while I was there. Although going back home is great, it is always busy. I find that no matter how well I try and plan my time I am forever rushing around and don't get a real chance to relax. Many of my expat friends say the same, they need a holiday when they return as a trip home is so exhausting. I loved seeing everyone though, I had missed so much since my last trip and it was great to catch up. We also made the big decision to sell our property in the UK. We had been keeping it in case we returned, but as that doesn't seem likely in the foreseeable future, we thought it made sense to have one less thing to worry about. It is quite a scary prospect, cutting all material ties with England, and it did feel quite sad packing up the rest of our belongings. It was also hard work! The majority of my trip was spent packing, selling furniture and meeting with estate agents. After being in NYC for well over two years and creating a life for myself, I realise that no matter where I live I would always be missing someone or something. I was sad to leave England and was emotional and teary as I waited for my flight, but when I go back to my apartment I was happy to be back in New York.